Since 2002, Washington H. Soul Pattinson has delivered total shareholder return of ~490%. That’s more than double the All Ords Accumulation Index and this year marks the 17th straight year of increased dividends. The firm is known for taking a truly long-term view and making counter-cyclical investments. Todd Barlow is the CEO of Washington H. Soul Pattinson and he recently spoke with Jeremy Hook from TMS Capital about the firms financial results and investment portfolio. Soul’s currently have a 25% shareholding in TPG Telecom. The latest investor presentation shows the value of this holding has fallen by ~$1.4 billion in the past 12 months as uncertainty around the impact of the NBN has seen TPG shares halve. Despite this fall Barlow says he is excited about their investment in TPG and that they have also recently disposed of their holding in Telstra. Here is an edited excerpt of Barlow's comments on the Telco sector with the full video interview available below. We're actually, as you'd expect from our side of the fence, counter intuitively quite excited about TPG. The share price has halved in the last twelve months. But we think that would be a little bit like saying that Amazon should get marked down in the retail sector. Amazon's the disrupter in the retail sector, and I think TPG is the disrupter in the telco sector. So the problems that are happening to the telco sector are the problems for everybody else but TPG. TPG is the lowest cost operator of broadband and as people migrate to NBN it becomes a level playing field. So really it comes down to what is your cost of administration, support, billing on top of the NBN charges. I think that being low cost - TPG will always be able to offer either cheapest plan, or the highest margin product. Is it fair to say the market underestimated the difficulties of the NBN? I think they did. I think there was a perception that you could continue to grow in a way that it was growing, and that was obviously going to stop when NBN started to kick in. But then I think the market has gone too far the other way now and they're very pessimistic about the entire sector. We have to have a profitable telecommunication sector. That's the reality of it. And it's a sector that's growing. People's consumption of data and voice is growing all the time. We have to have a profitable telecommunication sector. That's the reality of it. And it's a sector that's growing. People's consumption of data and voice is growing all the time. So we like the sector. It's just a matter of finding the right way to make good money. And I think mobile is definitely a really good move. How long does a shareholder wait? Soul Patts decades maybe, but for the TPG retail shareholder? It's sort of a circa three year period before TPG physically starts getting revenue from its mobile entry. But as you know in markets you don't necessarily need to wait until the revenue occurs. The market will start seeing that TPG is effectively rolling out its platform and its network. It's doing so in a cost effective way and the CAPEX is not blowing out. I think you'll start seeing some rerating of the stock as it gets closer to the date when it can start attracting customers. I think you'll start seeing some rerating of the stock as it gets closer to the date when it can start attracting customers. But in the meantime if you look at the price today it's a ten/eleven times PE stock. You're not having to take a bit punt on the future. You're getting a pretty good valuation right now. On the impact of TPG’s lower dividend on Soul Patts. That's a key point because it's something that we value very highly is the consistency of our dividend, and this year was the 17th straight year of increased dividend, which is something we're really proud of. In the reduction that we saw from TPG, whilst we think that it's a very positive thing that they're reinvesting in their business, and it should be distinguished from the other dividend cuts that people are having because their earnings are coming off. 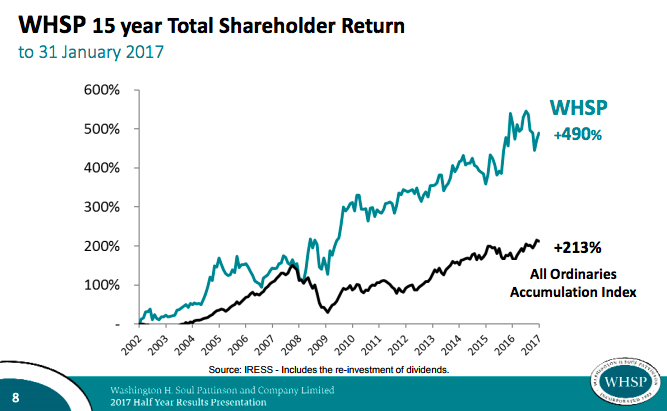 So we think it's a good thing that TPG is cutting its dividend, but it does create an issue for us from a Soul's perspective that we need to manage our cash receipts so that we can show we pay high dividends. And we're lucky because New Hope is a much more stable and much higher cash contributor these days and we think we'll be able to manage ourselves to make sure we keep increasing the dividend. Telstra I think is different. We're taking a view that it is going to be challenged by TPG. TPG's entry into the mobile market is going to be very disruptive to the telco sector and I think all of them will suffer, but certainly Telstra will as well. Harry - thank you for your comment. I share your view that the NBN may be a white elephant in the years to come, if technologies new to Australia are approved and rolled out here. High speed mobile internet is likely to supercede the NBN, hence TPG's move to mobile. The key advantage of TPG over Telstra and Optus is its low cost, highly efficient operation and its ability to make decisions thanks to David Teoh's ownership stake and the support of Soul Patts. TPG has significant scale and a number of brands. Its customer service runs laps around Telstra. In a commoditized business these advantages are significant. Agree with both previous comments. 5G is going to cause an issue for NBN. Furthermore, for all the talk of being a low cost provider, TPG (and the other Telcos) have no real value proposition for a large proportion of existing ADSL 2+ subscribers who are happy with their existing 12-20 Mbps speeds. The best NBN equivalent plan from any of the Telcos costs more, is not guaranteed to be faster, requires up front fees and min 2 year lock in. The only reason offered as to why I would want to take up an NBN plan now is that I will "eventually be forced to" (another dud Government initiative if I've ever seen one). The Telcos know they have no value proposition which is why they are indulging in aggressive and unconscionable sales tactics now - ultimately they fear there is a very real risk that alternatives are just around the corner. No thanks - I'll hold off on moving to NBN and buying TPG shares. Ivan and Grant, Pleasing to hear that some people have a realistic view of the telco market. Ivan I don't agree but totally understand your rationale. Imagine if Telstra is freed from the restraints of the competition watchdog and allowed to split its businesses! That"s a big threat to any competitor with that deep knowledge base that Telstra holds. I've seen nothing from Optus et al (including TPG) over the years that convinced me they are much better managers in the arena. I'm no big fan of Telstra because i see so much unlocked potential that their management has missed but I'm a holder because they will be the"first of the mark" in any ground breaking technology. How to make good value from this I will leave to others. I'm a holder of TPG shares and although a price decline is never welcome I'm also optimistic in the long-term. Teoh's main target is the NBN, not Telstra as such or even other telcos. He wants to pick the eyes out of the most profitable broadband customers, in the cities. That's why only covering 80% of the Oz population doesn't matter. No big deal if he loses one of two customers because they can't get voice reception in Broken Hill. Teoh's high density customers will then be aggregated via fiberTTB or 700MHz onto TPG's owned fiber infrastructure. The way to make a buck is end-to-end ownership. Of course Telstra will also be a casualty. You can easily imagine a scenario where in 10-15 years TPG, not Telstra is Australia's largest "telco". TPG has significant system and complinace problems. Our area was switched over to the NBN on 11 August 2017, but TPG is still invoicing and charging customers credit cards for ADSL services it has not been able to supply since that date and making it difficult to get the money back.